Since I spend a large part of my professional life creating and delivering presentations I need be to intimately familiar with the slideware application I use. My software of choice is Apple’s Keynote which is part of the iWork suite. My presentations are self contained in terms of any notes I make require being stored within my presentation in the Presenter Notes section of the file. To take full advantage of this I use the Presenter Display options to show a specific range of presenter tools on my secondary monitor in the precise configuration I prefer. Once enabled, the Alternate Display options can be configured via the check boxes in the ‘Show’ section of the Presenter Display Preferences (1). The check boxes act as toggles for each element enabling and disabling the option as required. While this gives a certain level of control over what is displayed the options do not allow the elements of the Alternate Display to be more finely controlled. 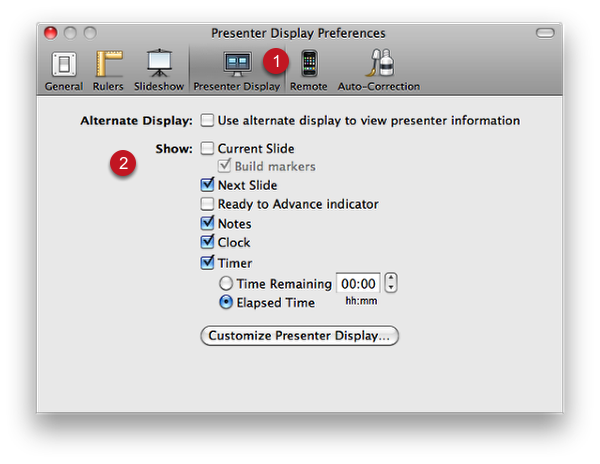 Fine control is achieved via the Customize Presenter Display… option (2). 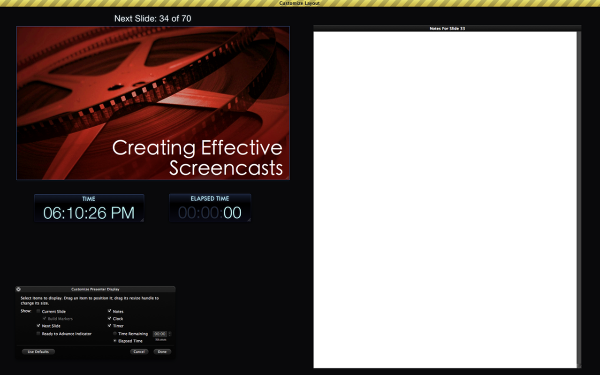 Clicking the Customize Presenter Display displays the Customize Layout screen on the alternate display. 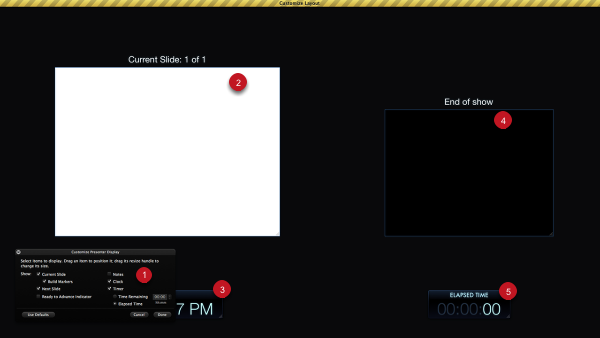 This view provides complete control over the layout of your Presenter Display. The Heads Up Display (HUD) (1) allows elements to be enabled and disabled. The enabled elements (2), (3), (4) and (5) can be moved to any position on the screen and resized as required. My preferred configuration is very different from the default. For example, I choose not to display the current slide in Presenter View as it’s displayed on the main screen anyway and since I don’t use bullet points I have no need to read the content of the slide to the audience! The version of Keynote mentioned in this article was written was Keynote ’09. 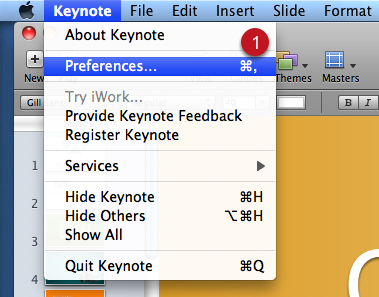 The new version os Keynote has radically redesigned Presenter View. There are now only very limited customisation options. All you can change in new version is whether elements are displayed or not, there is no option to manually configure the display to your precise requirements any more. Apple have said they are working on bring back features from the older version whether or not this includes the customisation features of Presenter View remains to be seen. I’m with Kayla. I was frustrated not being able to find my presenter notes while showing the show on a big screen. I was rescued by a printed version of the notes which had been made from the PowerPoint copy of the show. I have to wonder why Apple made these changes (read: broke) to the presenter notes option in Keynote6. I am not even able to see the presenter notes while in the slideshow. I don’t want to customize it but at least I could see them. I just upgraded to the new keynote and am highly ticked at the lack of customization options for the presenter display. I do not care about having 100 transition options that are distracting to the audience. What I most care about as a presenter is having my notes and display fully customizable so that most of my screen is notes on a larger font. This allows me to travel about the stage and easily glance at a distance my MBPro display to stay flowing in the presentation and set up my transitions. Without this ability, there is no real advantage to keynote. Is it stylish? Yes. Is it excellent for real presentations in the real world for people who cannot memorize all their notes? No way. Bring back the old customization options please!!! The motherfuckers responsible for this mess should be hanged, torn, and quartered. At this point I have given up on trying to make a presenter view work with Keynote. Setting up a separate display is cumbersome and often changes the resolution on the screen and can also lag depending on your WiFi. Using an IOS device as a remote to refer to your notes is just another device that has to be set up and managed during the presentation. At this point I create my presentation on Keynote and then export them to Power Point for the presentation. 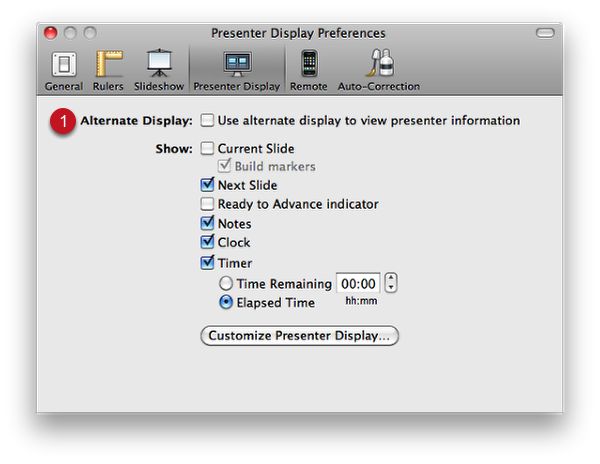 Hopefully Apple will add a seamless option for a presenter display soon. 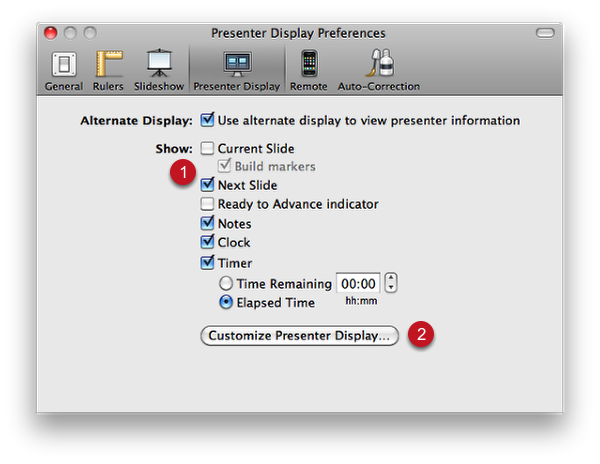 Same here, presenter’s note is very helpful, that why I’m using MS ppt for mac because of this feature. In ppt, you can easily do simple task like, changing the color of the font, undo and redo etc. though keynotes is sleek and smooth but functionality? I will go for ppt.